Earlier last month, San Diego’s Karl Strauss brewing announced the return of their Karl Strauss Amber, a 4.5% ABV Vienna Lager that’s made with toasted Munich and caramel malts and then balanced out with Cascade hops. The beer isn’t quite low enough in alcohol to be “officially” be considered a session ale, but I’ll be damned if it’s not one seriously quaffable and tasty brew. The crisp mouthfeel, medium body and flavor profile make for a refreshing brew that is well balanced and drinks easy. If the brewery ever decided to expand to the East Coast, I can see this beer being a staple in my fridge throughout the year. 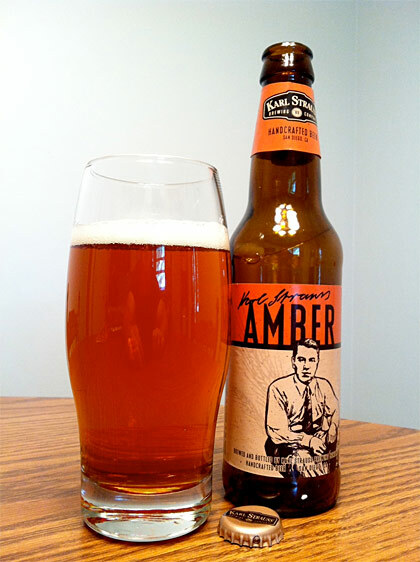 Karl Strauss Amber pours a brilliant amber in color with an off-white cap that fell slowly to sparse surface cover. Lightly toasted bread, cereal, grain, subtle malt sweetness and a light hop profile make for a rather subdued, yet welcoming nose. The beer has that classic lager taste. Lightly toasted malt, subtle sweetness, light caramel and grain arrive together before transitioning to the fairly dry finish that brings a welcome and low level of hop bitterness with it. The beer is rather simple in terms of complexity, but it just drinks so well. It’s nicely balanced, crisp and sessionable. This beer’s easy going, approachable nature and relatively low alcohol content make it a beer that you can sit down with for a while and hang out with friends while the ball game is on the television. It’s not overly complex (and it’s not supposed to be), well balanced and just a joy to drink. You lucky people out on the West Coast should be drinking this beer  right now. This is a review of a promotional sample received from the brewery.